We have been in business since 1980, dealing in antiques and fine art. Woodblock prints have always been an attraction, and in 1986 we acquired a large selection of works by Margaret Jordan Patterson (Amer. 1867- 1950) and later that year held the first catalogued retrospective of her work. We have issued fine print and painting catalogs yearly since then, with an emphasis on the woodblock medium. In 1987 we were fortunate enough to acquire a large collections of original Provincetown printing blocks and prints by then forgotten artist Ora Inge Maxim. Later that year we purchased a large group of similar blocks by important Provincetown artists Agnes Weinrich and Karl Knaths. This grouping of blocks led to an exhibit we curated at the Provincetown Art Association and Museum in March 1988, “Provincetown Printing Blocks,” the first museum exhibit devoted to printing matrices. (Catalogs of that exhibit are still available at the Museum or from us (see “Publications” link on this site.). For the past 28 years or so we have included woodblock prints from the Arts & Crafts era (c. 1895-1930) in our inventory. We exhibit yearly at the Grove Park Inn Arts & Crafts Conference & Show in Asheville, North Carolina. We have written and led discussion groups on the subject (see our “Publications” page to order a copy of the article we published in Style 1900 on the subject). We have also published articles on the Provincetown Print (see “Publications” link). 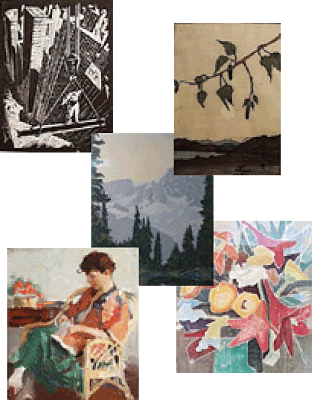 Click here to view one of the largest selections of framed vintage Arts & Crafts artwork anywhere. We exhibit at selected antiques shows and prints fairs (See “Shows” page), send our periodic email "blasts" highlighting recent purchases and showcase our inventory on the web. To receive our r"Blasts" and updates on upcoming shows, please sign up for our mailing list (below) or simply email us. (We never share your information!). We can also be visited, by appointment only, at our office in Woodstock, Vermont or at our new shop/gallery at 85 Gates St., White River Jct., Vermont. (Call or email for hours). We are just a short hop off Interstates 89 and 91 and near Dartmouth College. All Rights Reserved. Copyright 2019 Steven Thomas, Inc./STInc, L.P.